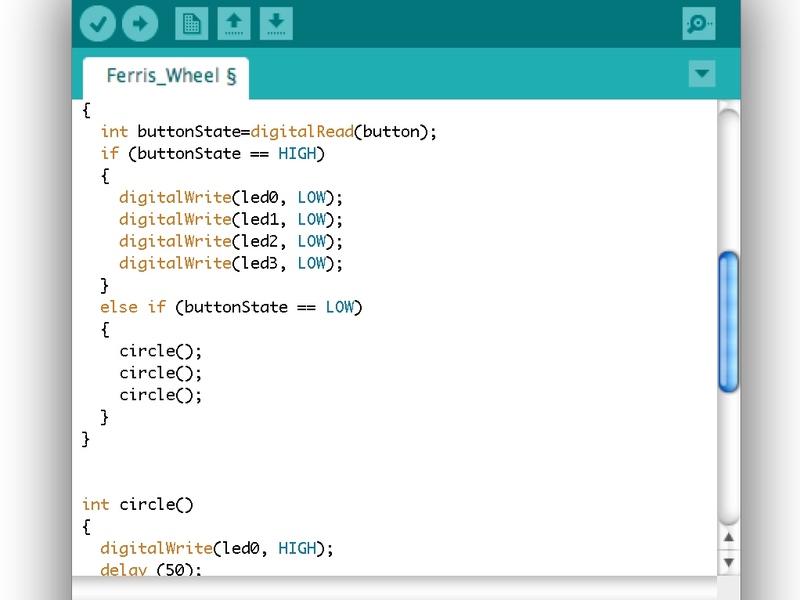 This tutorial will show you how to solder to circuit stickers and use the programmable microcontroller to create a ferris wheel with spining lights. 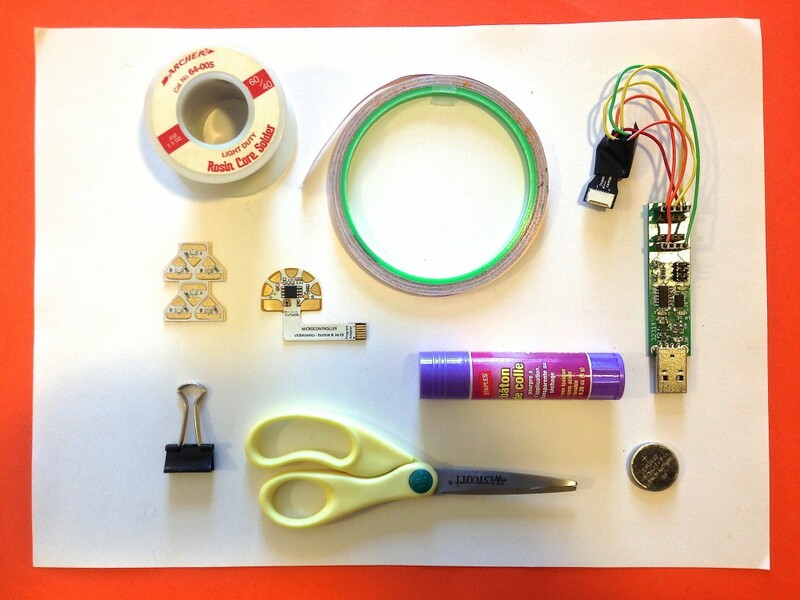 The tutorial will be divided into two sections- programming your microcontroller and crafting your circuit. 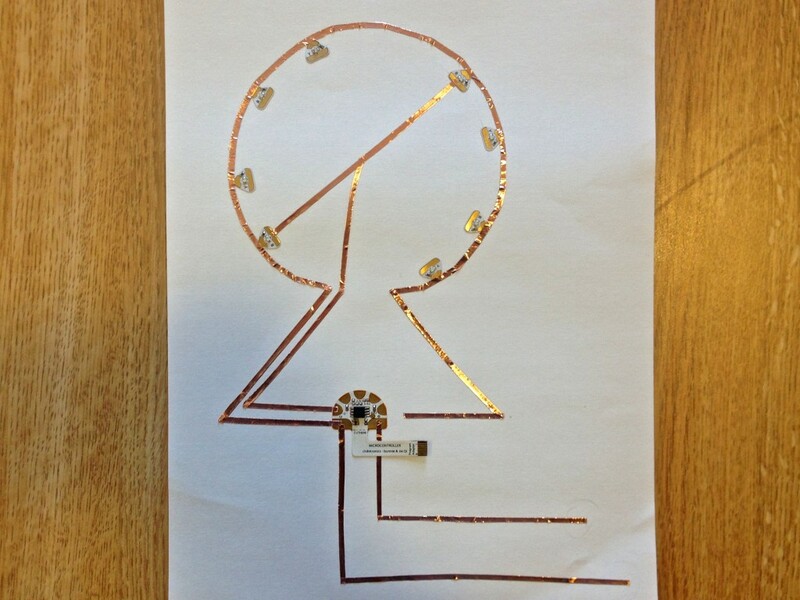 Preparation: On a piece of scrap paper, plan the circuit you want to create. 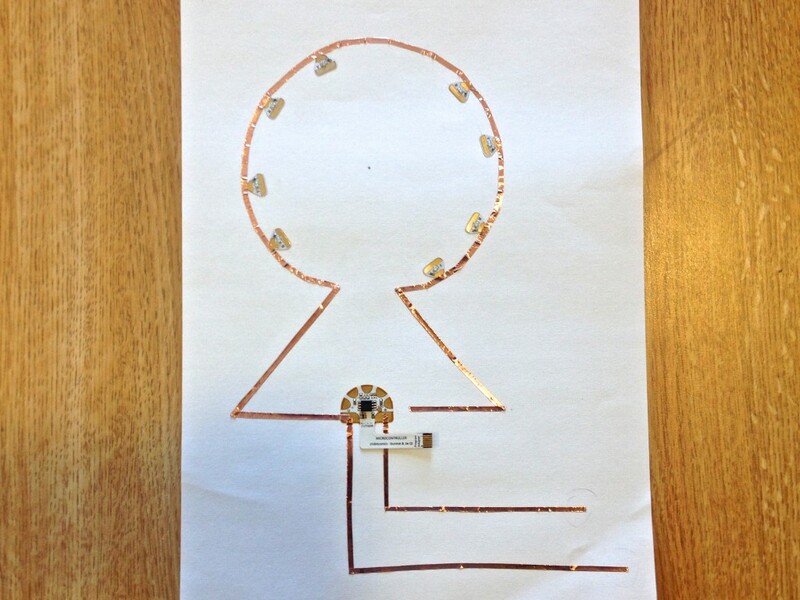 Make sure every LED is connected to the negative strip of copper tape and one pin of the microcontroller. NOTE: In my plan, I used different colors to indicate which pieces of tape would touch each pin. 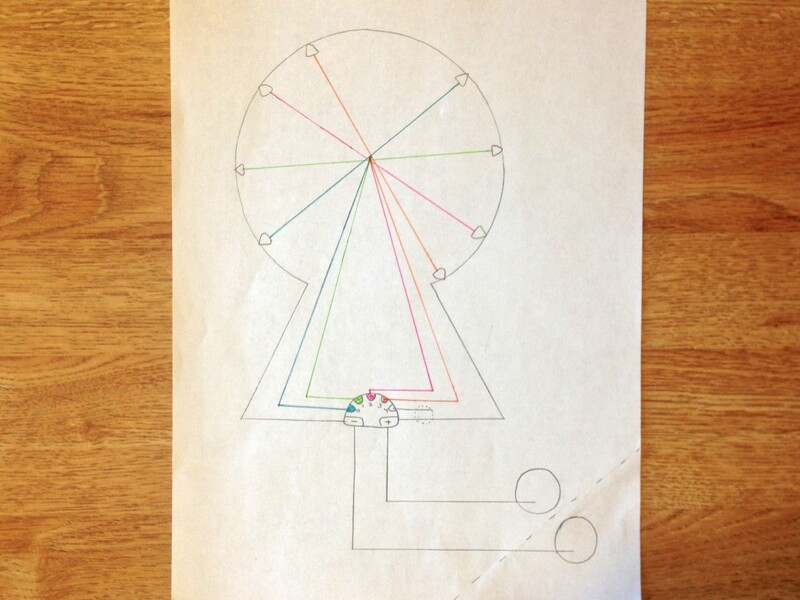 In the center of the wheel, there will be pieces of paper between each layer (each color) so the tape will not overlap. Initialize pins 0-3 as output and pin 4 (the button) as input. 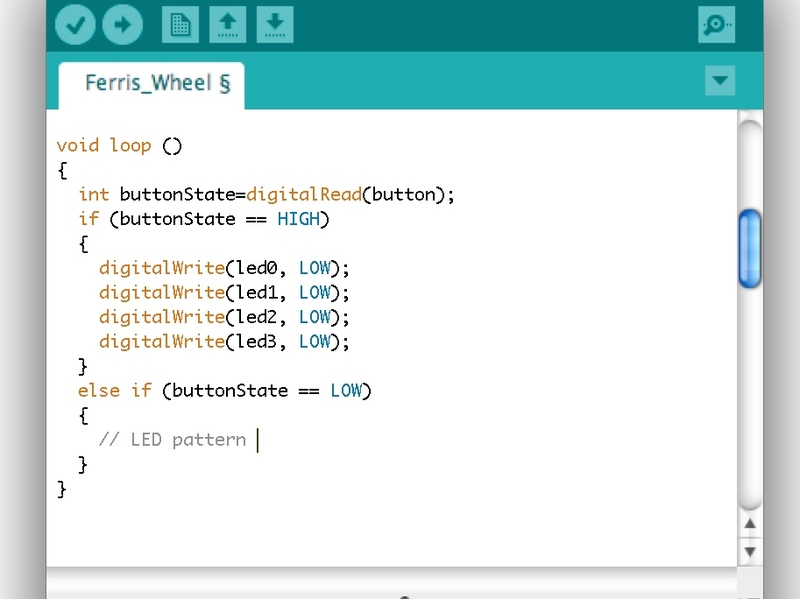 Set up an “if” statement that will run the LED pattern if the button is pressed. 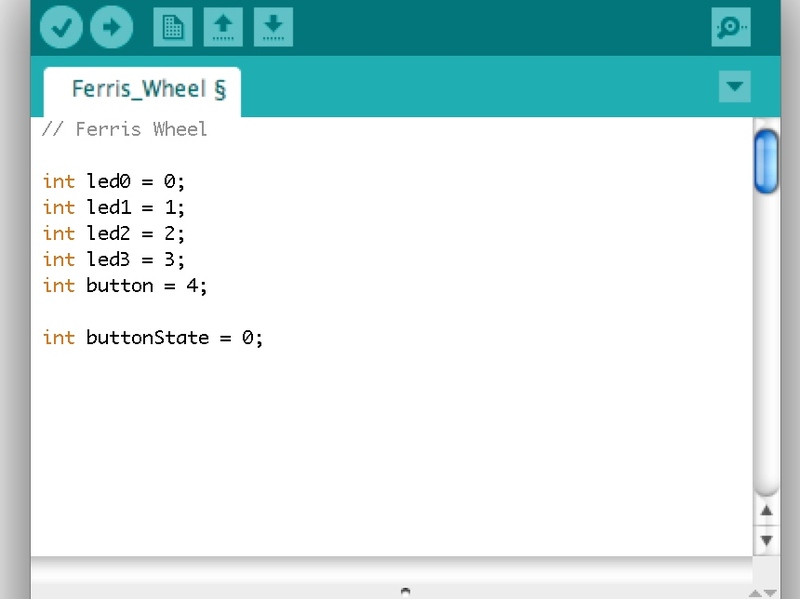 To reduce the lines of code needed in your program this tutorial shows how to create a basic function. 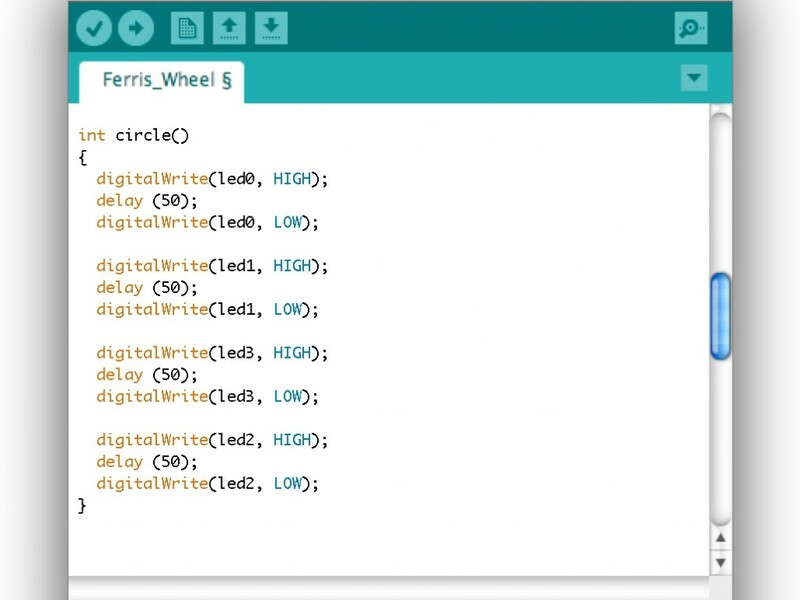 When called, this function will cause your LEDs to light up in sequence around the circle of your ferris wheel. This will be you “circle” function. 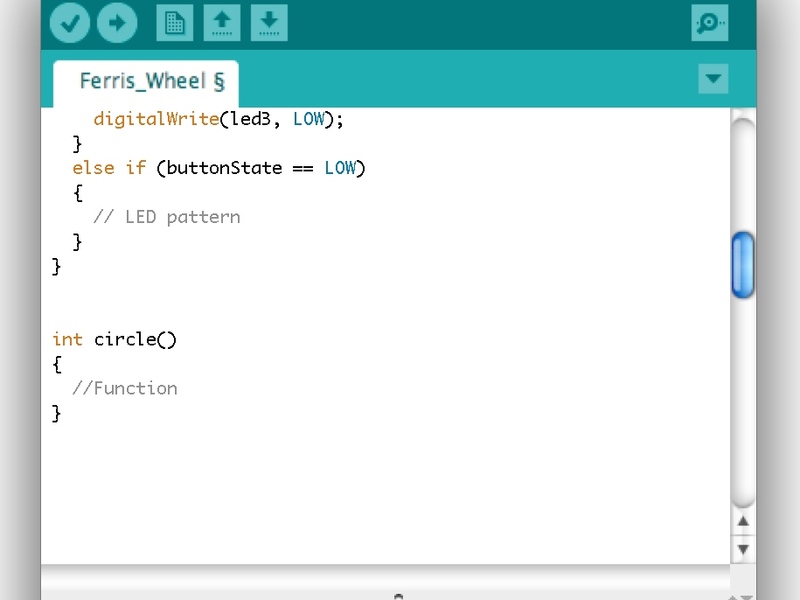 To create this function, first define the function by typing int circle ( ). 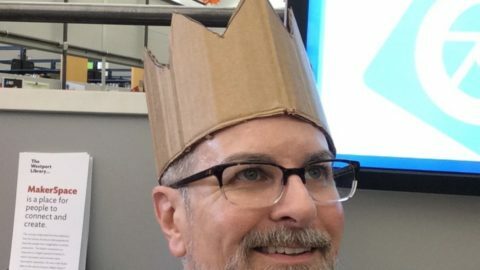 Here, the empty parenthesis indicates there is no input required for your function. Below this, within a set of brackets, write out the commands that the function will perform- turning the LEDs on and off in sequence. Call your circle function inside your else if statement by typing the name of the function followed by any inputs (in this case there are none). 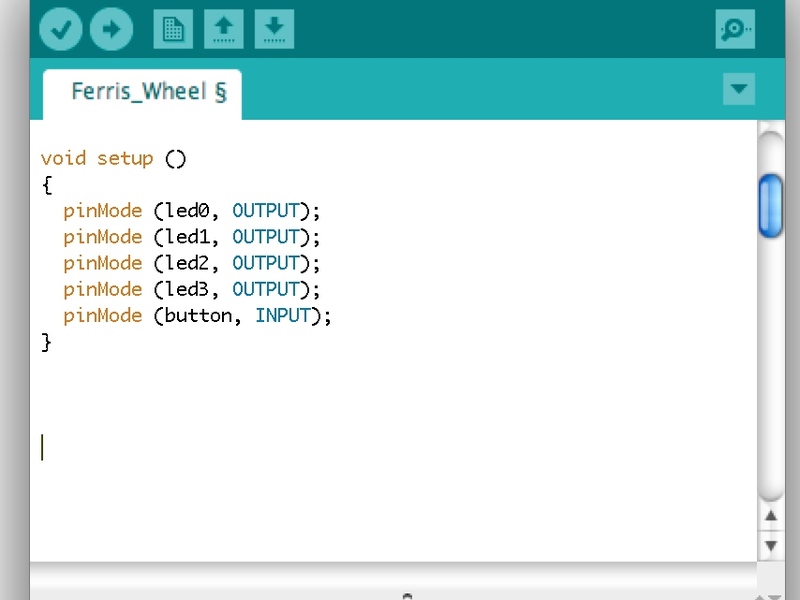 Call the function as many times as you want the LEDs to complete a full circle when pressed once. – This program could also be written without using a function, but the code would be much longer. In this technique, you will first place your LEDs, then connect them using copper tape. 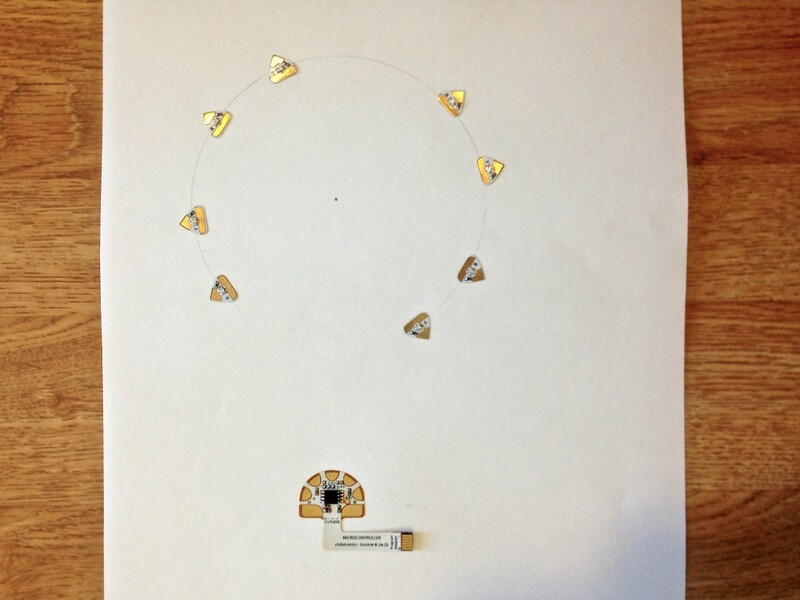 Because the tape will be placed on top of the LEDs’ conductive pads, rather than underneath, it will only form a weak connection. 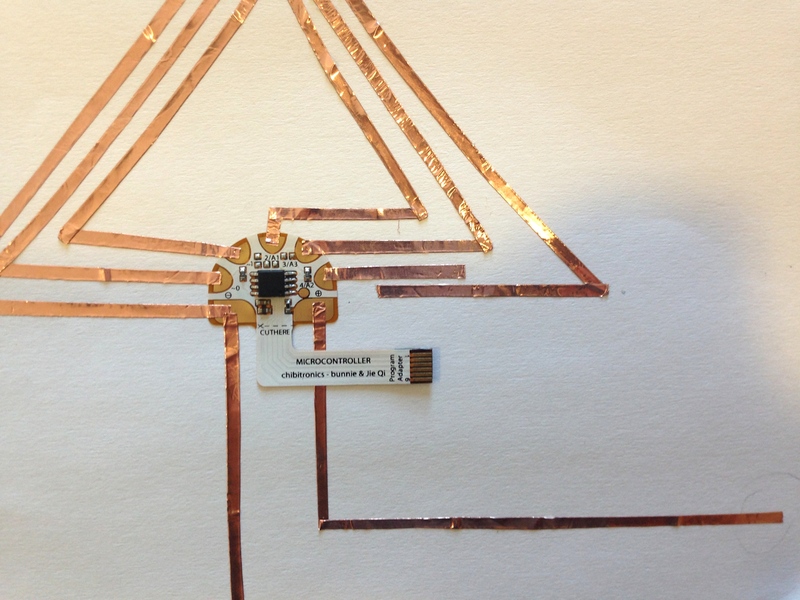 To fix this problem, you will then have to solder the copper tape to the LED. Step 1. 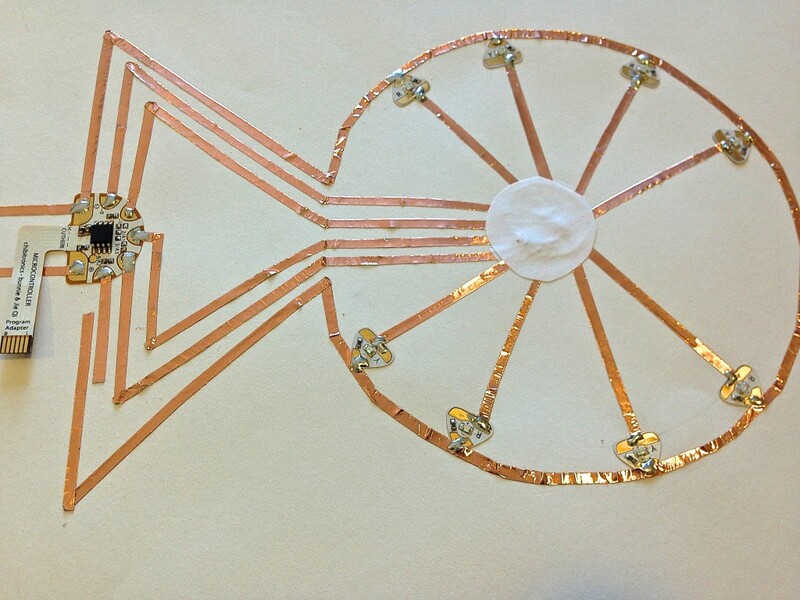 Based off your sketch, place your LEDs and your programmed microcontroller sticker on a piece of cardstock. 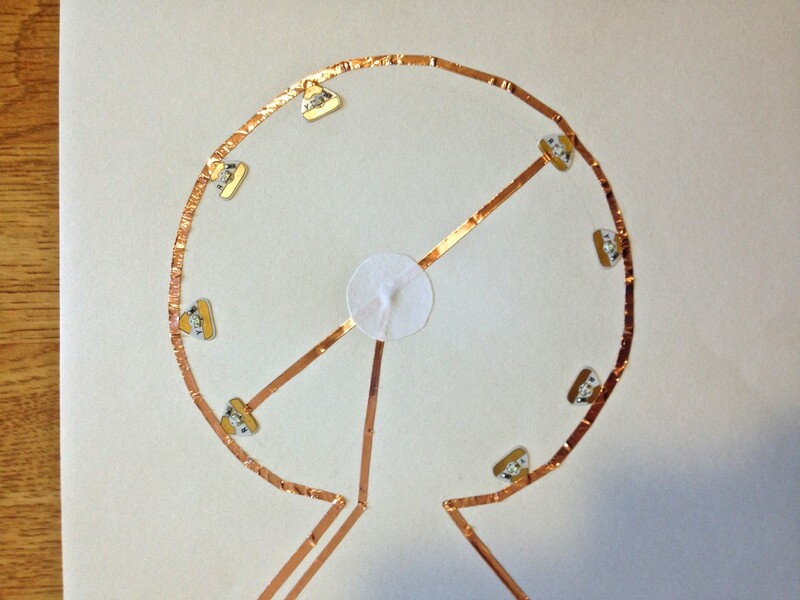 It may help to draw a light reference circle on the cardstock so that your LEDs are properly spaced around the wheel. Step 2. 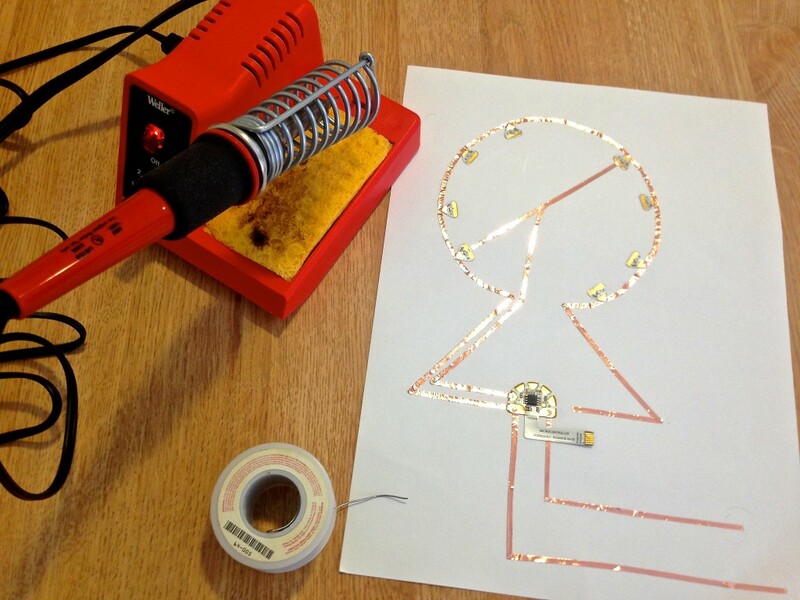 Begin adding copper tape to your circuit. 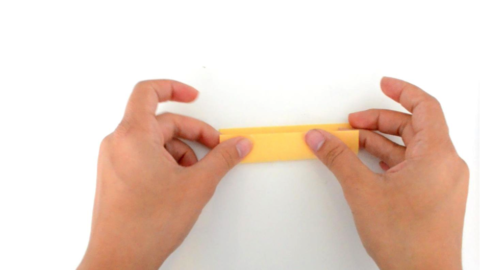 Start by laying the outermost piece of tape (connected to the negative terminal of the microcontroller) and the two pieces connecting the microcontroller to the battery. HINT: to make the tape thinner, cut it in half length wise. Step 3. 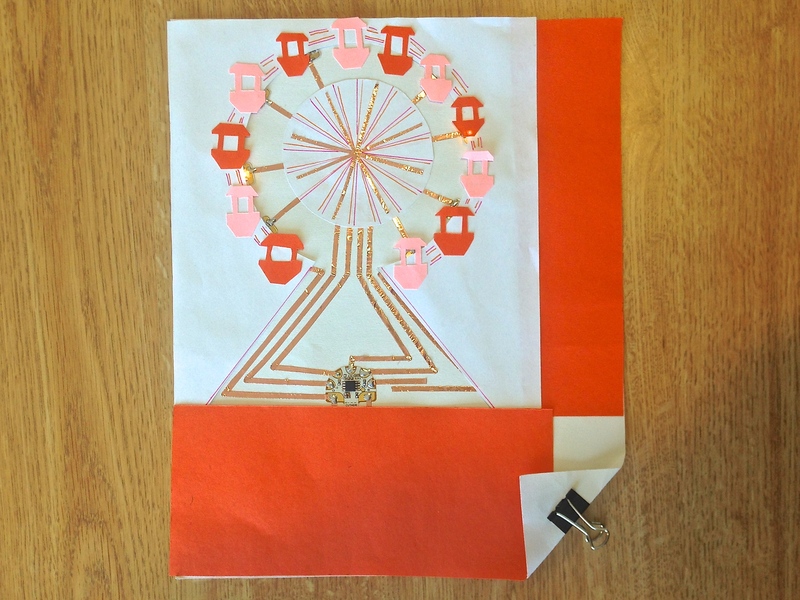 Use copper tape to create the first spoke of the ferris wheel (drawn in blue on my sketch). 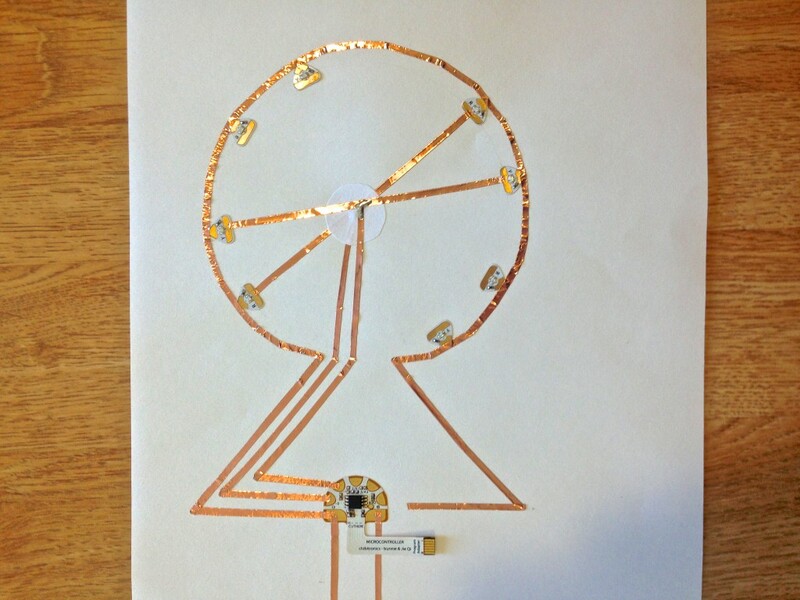 Because the piece of copper tape attached to the microcontroller forks into 2, create the spoke out of a separate piece of tape. 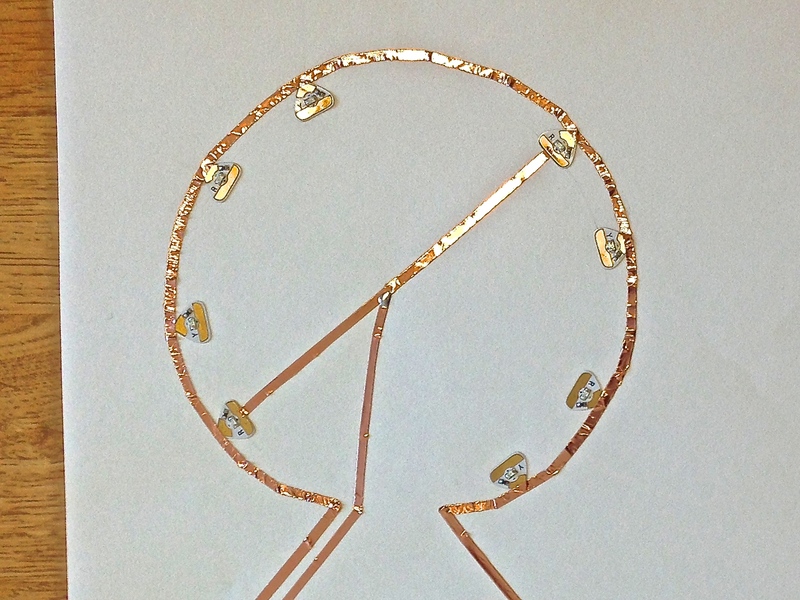 This will later be joined to the first piece by soldering. Step 4. Solder together the 2 pieces of copper tape of the fist spoke in the center of the ferris wheel. 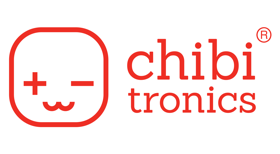 Click here for brief tutorial on how to solder. Step 5. Cut out a small circle of paper. Glue this over the center of your ferris wheel to prevent the copper tape of the first spoke from touching your second spoke. Step 6. Lay copper tape for the second spoke of the ferris wheel. 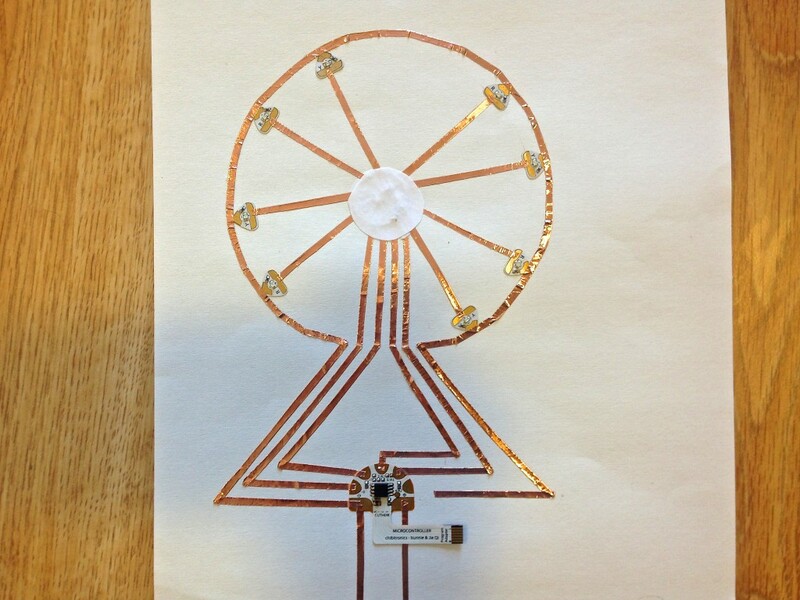 Once again, solder the connection in the center of the wheel, then glue a piece of paper over the connection. Repeat for spokes 3 and 4. Step 7. 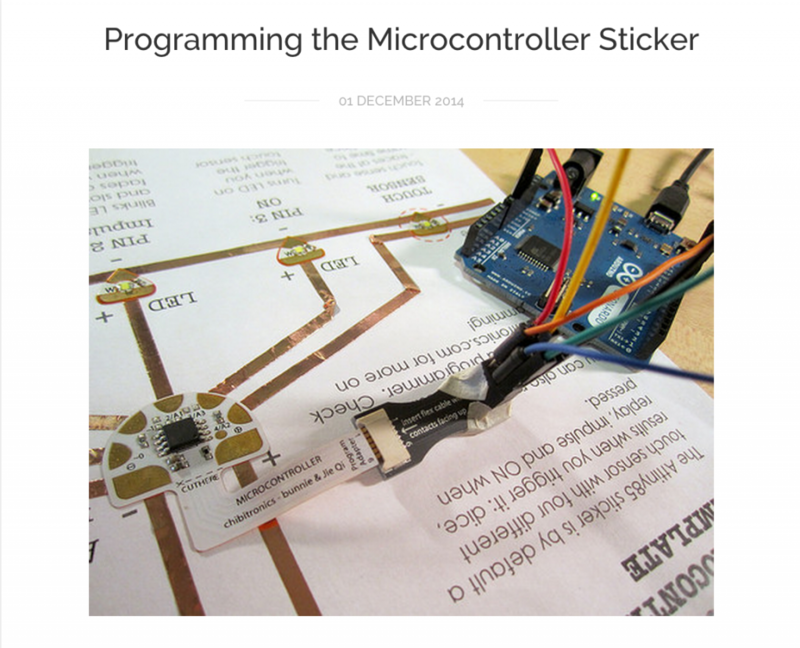 Add a piece of copper tape to pin 4 of the microcontroller to create your button. Step 8. Solder all the remaining connections between the copper tape and the conductive pads of the circuit stickers. Step 9. 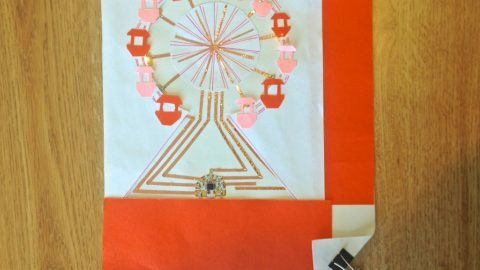 Decorate with construction paper and add a battery to complete your ferris wheel!